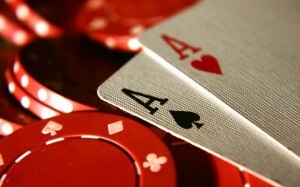 Also known simply as Hold’em, this variation of 7-Card Stud, is becoming the most popular poker game in the world. Also known simply as Hold’em, this variation of 7-Card Stud is one of the most popular poker games in the world. Blinds: Two (2) players left of the dealer button both post blinds equal to exactly half the limit they are playing. Example $4-$8 Hold′em, blinds are $2-$4. (This is equal to the ” ante” in 7 Card Stud). Pocket or Hole Cards: Dealer deals each player 2 cards face down. The Flop: Dealer turns over 3 community cards. Second betting round: after the Flop. The Turn: Dealer turns over 1 community card. Third betting round: after the Turn. The River: Dealer turns over one last community card. At this point there will be 5 community cards of which you will make your best 5-card poker hand. You can use all 5 community cards and none from your hole cards to make your best hand, 4 community cards and 1 from your hole cards to make your best hand or 3 community cards and both of your hole cards to make your best hand. Final Betting Round after The River. Showdown. The Showdown is where players reveal their hands to produce the winner. The winner is the highest-ranking poker hand available from all hands remaining after the river card.